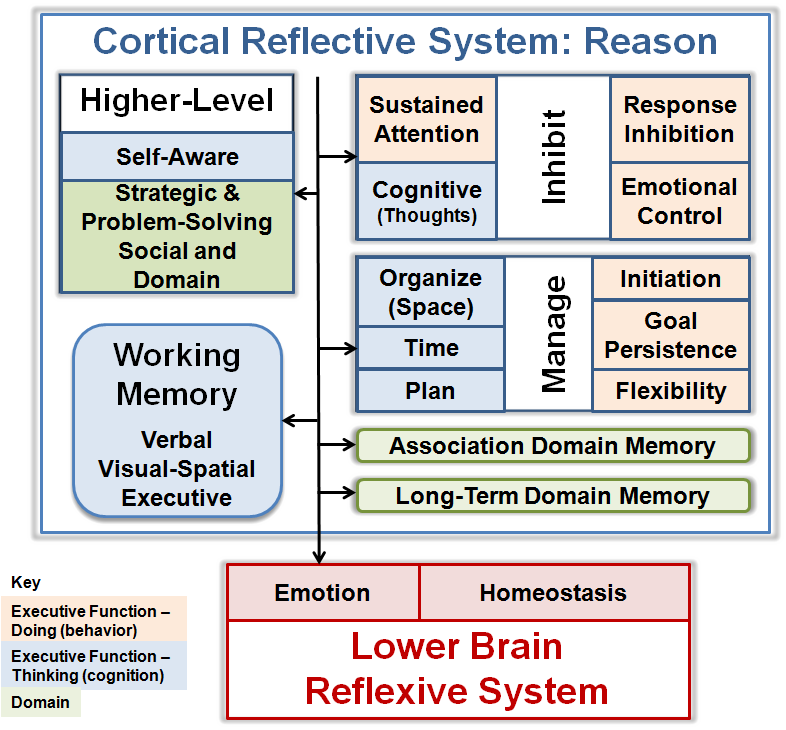 We manage what we do (emotions and behaviors) and think (cognition and attention) through mental processes called executive functions. These skills are vital to achieving positive goals, such as maintaining good relationships, learning, and maintaining well-being. Most people have a mix of executive function strengths and weaknesses. Once identified, the weakness can be strengthened with game exercises and/or compensated for with tools. In their book, "Smart But Scattered", psychologists Dawson and Guare divided the executive function skills into 11 skill categories that they felt could be independently measured and developed. Neuroscientists have only found 7 brain regions that they have recognized for executive function processing. So, today there is not total agreement on what is an executive function as compared to other general cognitive function. To avoid confusion, we mostly use Dawson and Guare terminology. These can be divided into three main areas: Management skills, Inhibit skills,and Working memory skills. Some of these skills have to thinking and others have to do with acting or behaviors. The management and working memory skills are frequently used in a sequence to solve a problem. Inhibit skills are used through out. If your child is having a challenge in a skill prompt during the right stage of the sequence. Some children will have developmental delays and catch up later, but many will not catch up. So if your child is falling behind in any of these areas, it is wise to start providing support immediately. 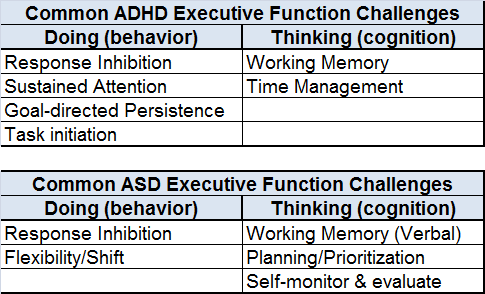 Each child is different, but children with ADHD and Autism Spectrum (ASD) frequently have a common pattern of executive function challenges. Below, we give the definition of each executive function and expected capabilities for different age groups starting at 4 years old so that you can see how your child is doing. We start learning executive function skills at 6 months old. The behavior functions reach adult levels by early adolescence, but the thinking functions don't mature until early adulthood. The sections below provides examples of what can be expected at a given age, from 4 to 13 years old. You can determine your child Executive Function Quotient (EFQ) or each executive function, find the age level your child is currently at and divide by his age. For example Emotional Control, say a child is 10 and is currently at 5, his EFQ would be 5/10 or 50% for that function. This indicates this child needs considerable explicit support to learn that skill. You can build a profile of all his functions. Above 120% is strength and below 80% is a weakness. Use his strengths to compensate for his weaknesses. Flexibility/Shift: The ability to move freely from one situation to another and to think flexibly in order to respond, revise plans in the face of obstacles, setbacks, new information or mistakes, behaving adaptability to changing conditions. Shifting is the ability to think about one activity and then shift one’s thinking to another activity. Shifting is required not only between tasks, but also between steps within a task. Goal-directed Persistence: The capacity to have a goal, to follow through to the completion of the goal, and not be put off by or distracted by competing interests. Response Inhibition: The ability to think before you act, evaluate a situation and how our behavior might impact it, then stop one's own behavior at the appropriate time, including stopping actions and thoughts. 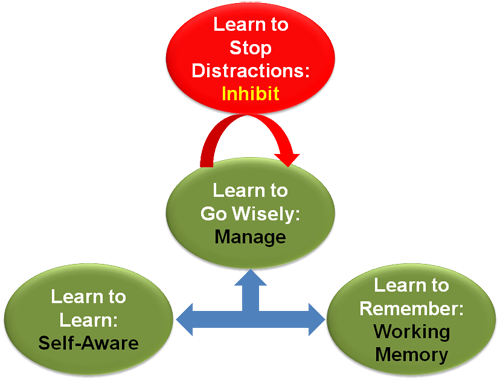 Sustained Attention: Ability to maintain attention to a situation or task despite distractibility, fatigue, or boredom. Task Initiation: The ability to begin a task or activity without undue procrastination, in an efficient or timely fashion, and to independently generate ideas, responses, or problem-solving strategies. Organization: The ability to impose order on work, play, and storage spaces by creating and maintaining systems to keep track of information or materials. Organization requires an understanding of what needs to be done and a plan for implementation. 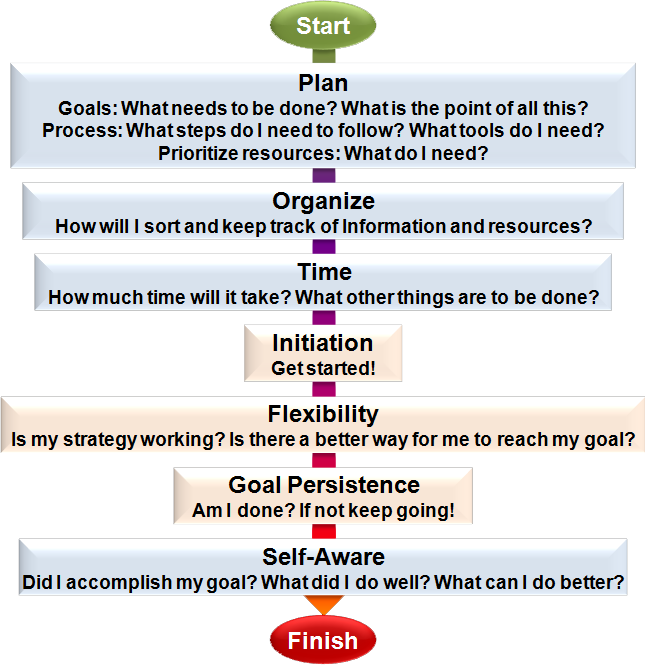 Planning/Prioritization: The ability to to manage current and future oriented task demands byn creating a roadmap to reach a goal or to complete a task. It also involves being able to make decisions about what’s important to focus on and what’s not important. Self-monitor/Self-evaluation/Metacognition: The ability to stand back and take a birds-eye view of oneself in a situation, such as how one problem solves. It also includes self-monitoring and self evaluative. skills (e.g., asking, “How am I doing? or How did I do?”). Time Management: The capacity to estimate how much time one has, how to allocate it, and how to stay within time limits and deadlines. It also involves a sense that time is important. Working Memory: The ability to hold information in memory while performing complex tasks. It incorporates the ability to draw on past learning or experience to apply to the situation at hand. Those with weak response inhibition often have weak emotional control. The inflexible also tend to have weak emotional control. Those with weak task initiation often have weak sustained attention, and can have weak goal-directed persistence. Those with weak time management ability often have weak planning/prioritization. Those with weak working memory often have weak organization. If your child has challenges in one area it is good to provide support for the other.